If you’ve flown on an airplane recently, you’ve been exposed to radiation. This risk is one that most probably don’t think about when boarding a plane, but it is very much real. In fact, your chances of being exposed to harmful radiation while flying are much greater than the chances that your airplane will crash. Because your chance of being exposed to radiation while flying is 100%. Yes, you read that correctly. Whenever you fly, you’ll be exposed to radiation—no matter how long the flight. However, as we will see, there are several factors that influence just how much radiation you absorb. Additionally, we’ll take a look at how this radiation affects you and what you can do about it. Join me below as I walk you through everything you need to know about airplane radiation. Is There Radiation from Flying on Airplanes? We’ve already established that there’s radiation from airplanes, but where does it come from? You may be surprised to learn that it’s not coming from the airplane itself—or from the technology on it. Instead, this form of radiation is known as cosmic radiation, and it comes directly from space. According to the CDC, cosmic radiation is emitted from the stars—including the sun. This radiation then comes down to Earth. Fortunately, the atmosphere does a nice job of protecting us from this radiation; however, while outside, there’s really no way to escape it. Cosmic radiation levels on the ground, however, prove so low that they’re not worth mentioning. Here, we’re only exposed to naturally-occurring levels of radiation that are unavoidable. As we’ll see, however, flying increases one’s cosmic radiation exposure—so much so that those who are flying need to take precautions. So just how bad is cosmic radiation? Bad enough that some pilots take extra measures to make sure that they’re not absorbing too much. Though some estimates predict that one would need up to 5,000 hours of exposure per year before there would be any risk, it’s worth mentioning that not everyone responds to radiation the same. For example, even the above study admits that some people are pre-disposed to radiation, meaning that they don’t tolerate it as well. This leads to the development of conditions such as cancer, or to passing on genetic defects to children at birth. For this reason, those who feel as if they may be predisposed to the effects of radiation should take extra precautions while flying. It’s also worth mentioning that in-flight radiation is enough of a concern that even the federal government of the United States has taken measures to help citizens measure their levels of cosmic radiation exposure while flying. If you’ve been flying recently and are now concerned about your radiation exposure, you can use the government’s galactic radiation calculator tool. This tool, managed by the Federal Aviation Administration Office of Aerospace Medicine Civil Aerospace Medical Institute, can provide useful information concerning your radiation exposure. To use their tool, however, you will need to know specific information, such as the date of the flight, the flight’s origin and destination codes, the number of en route altitudes, and the number of minutes it took before your plane arrived at its first en route altitude. You may not have this information for past flights. However, if you’re concerned about your cosmic radiation exposure, be sure to record this information while in your flight. So how much cosmic radiation are you exposed to during your flight? As we’ll see, it depends on a number of factors. Additionally, before I answer this question, make sure to understand just how radiation is measured. The typical measurement for cosmic radiation is millisieverts (mSv). Currently, the International Commission on Radiological Protection (ICRP) recommends that those traveling through the air receive no more than 20 mSv exposure per year. Studies indicate that even the heaviest of travelers fall well below this recommended level, with even flight personnel receiving only a little over 2 mSv per year. So, many believe (like the creator of the below video) that exposure to radiation from an airplane is not particularly dangerous as the cosmic radiation levels that the body is exposed to is well within the prescribed limits. The risks will only be substantial if the frequency and total duration of travel is very very high. However, when analyzing this data keep in mind two things: it’s possible that your body is more susceptible to radiation than average, and the overall cosmic radiation that you’ll be exposed to on your flight depends on a number of things. Because here’s the thing: the airplane’s fuselage does nothing to protect you or your loved ones from radiation. Instead, cosmic radiation can seep through small cracks in the plane and make its way into your bloodstream. For this reason, it’s important that you take extra steps to protect you and your loved ones from cosmic radiation. Though you may feel its safe because this radiation falls well below standard guidelines, you don’t want to accumulate too much of it. Remember that the effects of radiation exposure are cumulative. It’s not as if your body’s radiation tolerance resets after each flight. Instead, you’ll need to consider this, as well as many other factors, when determining which flights are right for you. Finally, do also remember that you want to keep your total amount of radiation exposure low. Though the CDC notes that the amount of radiation exposure from flying coast-to-coast in the US is less than that of getting a chest x-ray, you can compound your exposure levels in a number of ways. For instance, if you’ve not protected your skin, you may be getting UV radiation, or if you wear an Apple Watch (Read my article on apple watch radiation), you could be taking in extra radiation, as well. This can be compounded with any recent x-rays you may have had—and even your cell phone use. Now, listen, I’m not trying to say that you shouldn’t do any of these things. They all provide their own benefits, and we shouldn’t take that lightly. I’m just saying that we should be careful about our radiation exposure—and this means in all phases of our lives. With this in mind, it’s important to take a look at the factors that influence the amount of cosmic radiation absorbed. Every time you fly on a plane, you’re exposed to increased levels of cosmic radiation. However, not every flight will expose you to the same amount. Below, let’s take a look at the three main factors that influence how much radiation you’ll be exposed to on your flight. You can expect to be exposed to decreased levels of radiation. This results for two reasons. First, the magnetic energy around the equator works to push cosmic radiation away. Second, the atmosphere near the equator tends to be a bit thicker, adding a bit more natural protection against cosmic radiation. However, those traveling further away from the equator in either direction will find that they’re exposed to more radiation. This is especially true for those flying closer to the North and South poles, as the amount of radiation increases with the distance traveled from the equator. For this reason, if you plan on taking flights that aren’t near the equator, be sure to take extra steps to protect yourself from cosmic radiation. The altitude, or how high you fly, also affects your level of cosmic radiation exposure. When you think about it, this one should come as no surprise. The higher up you are, the closer you are to the sources of cosmic radiation. Additionally, you’ll have less atmosphere to protect you from it—meaning that you’ll be exposed to higher levels of radiation with less protection. Unfortunately, it’s not as if you can sort your plane tickets by altitude. Because of this, you’ll likely be in the dark about your plane’s altitude until you’re actually on it. The best way to cut down on this radiation, then, is to take some steps to make sure that you’re protecting yourself from it even if you don’t know how high you’ll be flying. Below, I’ll include some of the best ways that you can decrease your exposure from airplane radiation. Finally, the duration of your flight will significantly affect your cosmic radiation exposure levels. The longer you fly, the more radiation you can expect to be exposed to. For this reason, longer trips—such as Atlanta to Beijing—will have higher amounts of cosmic radiation exposure than shorter ones, like Atlanta to Houston. This doesn’t mean, however, that shorter flights don’t have radiation exposure. If you’re looking to cut down on radiation, there are a number of steps that you can take no matter the height, duration, or latitude of the flight. Lets see these one by one in detail. First and foremost, if you want to decrease your radiation exposure, choose a shorter flight. 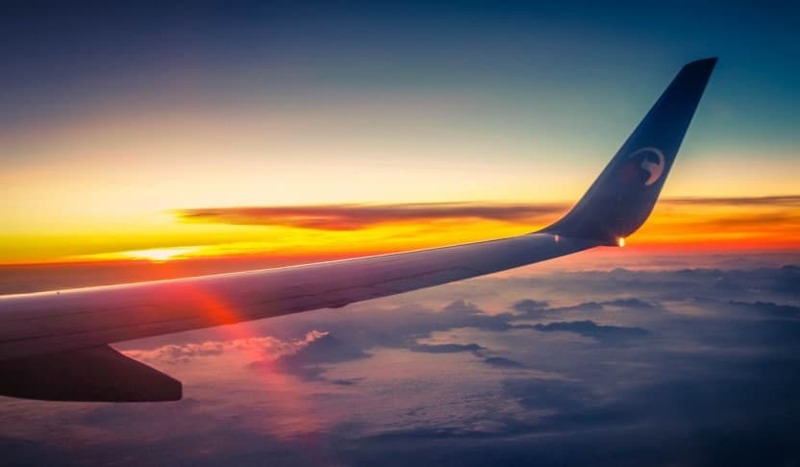 You may have to spend more money to get more direct flights; however, the extra money is worth it when you consider the damaging effects that radiation exposure can have. Pro Tip: if your destination is in driving distance, you may choose to simply not fly at all. This will prove the best way to reduce your cosmic radiation exposure. Before selecting your flight, see if you can find the flight’s path. This may be easier to do if you have layovers, as you can see if your plane will get further away from the equator than necessary. For example, if your final destination is to Shenzhen in Southeast China, you likely don’t want to choose a flight that has a layover in Moscow. Even if the flight is cheaper, you’ll have to first fly further north—and away from the equator, thus increasing your cosmic radiation exposure. Those looking to cut down on their radiation exposure in general may choose not to fly before or having x-rays done. This can help you make sure that you’re not exposing your body to too much radiation all at once. To help your body fight off the damaging effects of radiation, be sure to eat the right diet. This is one that includes plenty of phytonutrients. These can be found in foods such as onions or garlic, as well as dark green vegetables. With this in mind, let’s look at a few final considerations you should make while flying. Women who are pregnant should take special care when flying. If possible, flying may be best to avoid. Though experts agree that the amount of cosmic radiation exposure one receives from one flight isn’t enough to put pregnant women at a health risk, those who will be flying for extended periods may need to rethink their decision. Pregnant flight attendants, pilots, or other aircrew, especially, should reconsider when flying while pregnant, as they may exceed safe exposure levels. In the same vein, parents with babies or young children may want to limit the amount of flying that they do. Because babies and children are especially susceptible to the effects of radiation, it’s best to stay on the ground, or choose flights with lower exposure levels, if possible. This is especially true for parents who travel frequently, as the accumulated effects of radiation exposure may prove damaging. Read my post on effect of radiation on babies. Cosmic radiation from airplane travel is a real risk of which the public should be aware. If you travel frequently, make sure that you’re taking the right precautions to prevent from absorbing too much of this naturally-occurring radiation. By using this guide, you can start to make the right decisions to protect yourself and the ones you love from unnecessary radiation exposure. And, remember, though you may not be at substantial risk if you’re just an infrequent flyer, the total amount of radiation you absorb from all sources should be considered. For this reason, be sure to keep a close eye on your radiation exposure from all sources so that you can minimize any future complications. Thanks for reading! Before you go.. Check out my recommended products for EMF Protection.